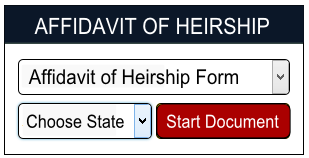 An Affidavit of Heirship is a legal form used to state the heirs of a deceased person. Heirship Affidavits are used to establish ownership of personal and real property when a person dies without a will. It consists of a sworn statement under oath by members of the family and witnesses. To legally assert that you are the lawful heir of the deceased person. To affirm your legal rights as an heir over the personal and real property of the deceased person.